Our laundry room makeover is slowly taking shape, so I thought I'd share an update, plus the most interesting thing we've completed so far: our new ceiling! 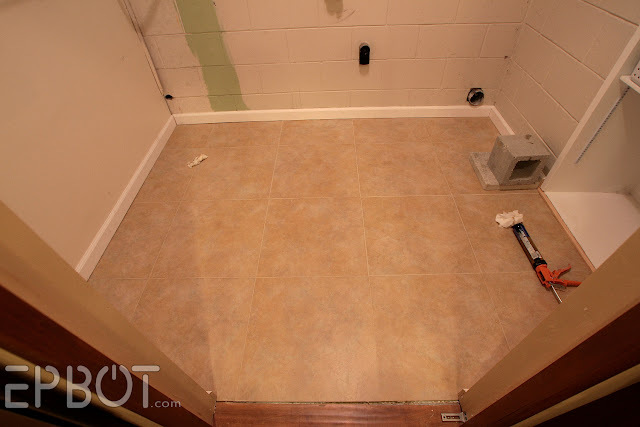 This is also after John took up the old adhesive floor tiles and trim, so at least that part wasn't *quite* this ugly before. Still: UG. 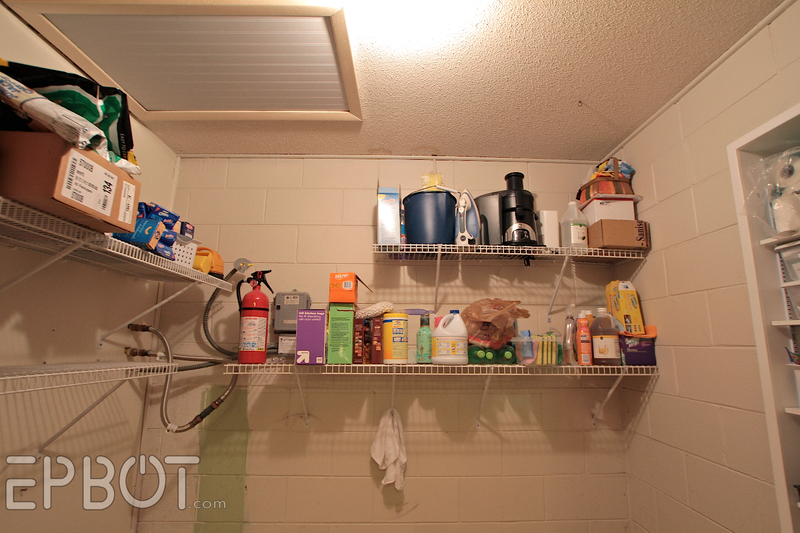 The recessed shelving on the right used to be an exterior door, believe it or not. John removed the door and built out that recess in its place. (The outside has insulation and exterior siding to match the rest of the house.) Since we never used that door, it's been a super handy upgrade for more storage. 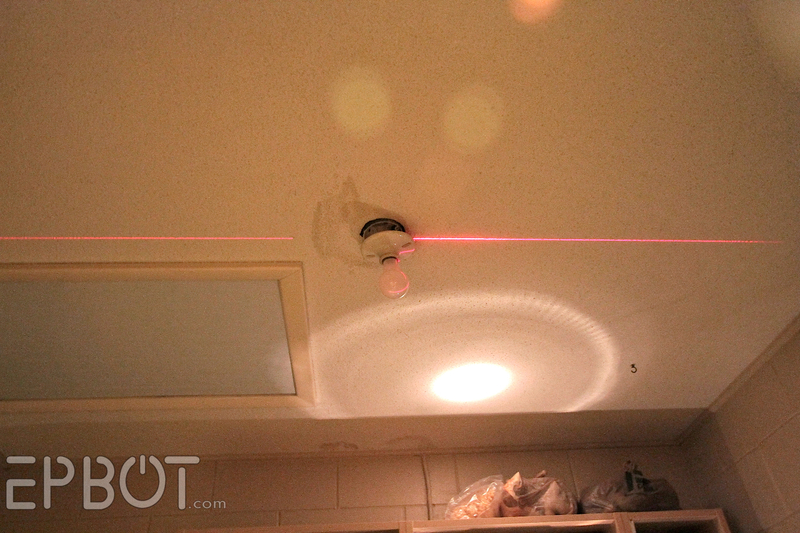 Ok, now let's get to the fun part: our new ceiling! These are Styrofoam ceiling tiles you can glue up right over popcorn ceilings! No prep work required! I've already used tiles like these in my office and bedroom closet, and I freaking LOVE them. 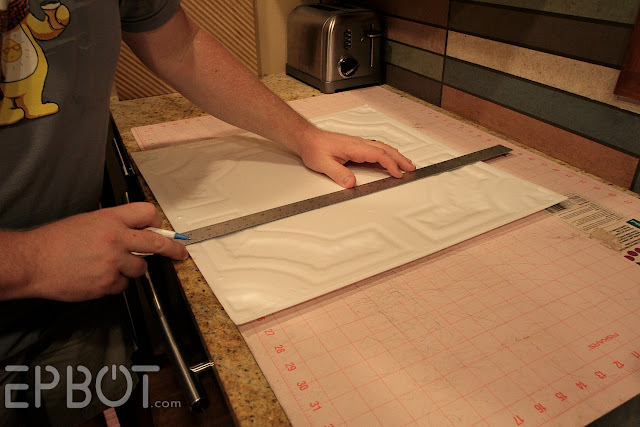 There are dozens of different designs you can choose from, they're surprisingly cheap (no more than $4 per 20-inch tile), and they go up in a matter of hours. You can barely see the seams for this design, which makes it look like a big mass of swirly circles up there. So fun! Yes, my closet is pink and has a tiny crystal chandelier in it. WHAT. You can also just use a string or chalk line, though. The first tile is the most important; if it goes up crooked, your whole ceiling will be off. The only trick is making sure you squeeze out really high piles of glue at each spot, the better for it all to smoosh into place once it's on the ceiling. Make sure you mark the *back* of your tile, of course, so you don't have any ink left on the front. 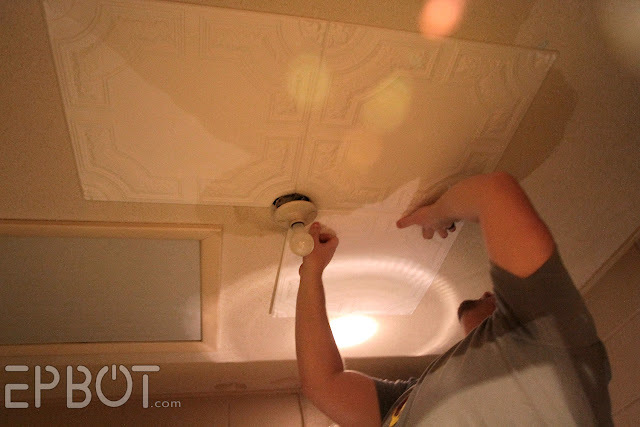 Even with all the small cuts and odd corners, John was able to finish the ceiling in just a few hours. After you get all the tiles up comes the really time consuming part, though: caulking in all the lines. These tiles are great, but they're not perfectly square. 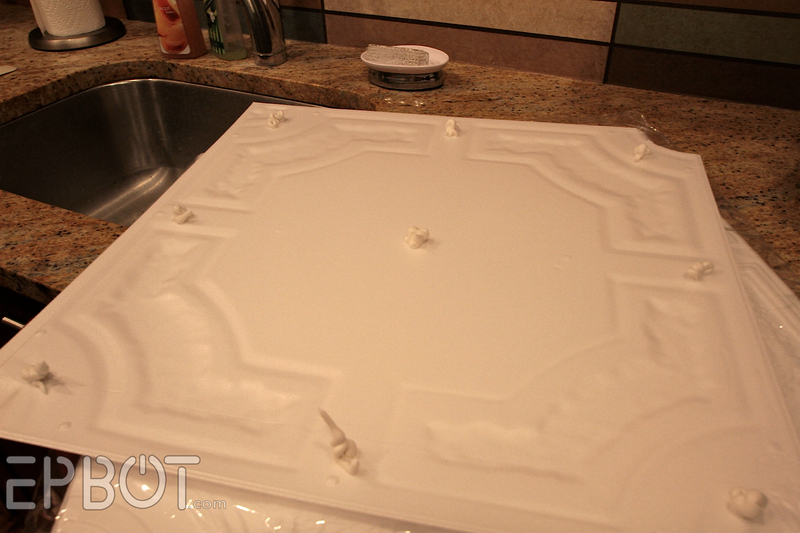 That means you'll have small gaps here and there between them, which you have to fill in with caulking. Not a big deal, but it does take a while. Pretty, huh? We're aiming for a vintage industrial vibe back here, but of course nothing else is finished yet - not even the light. Stay tuned for updates as I have them. 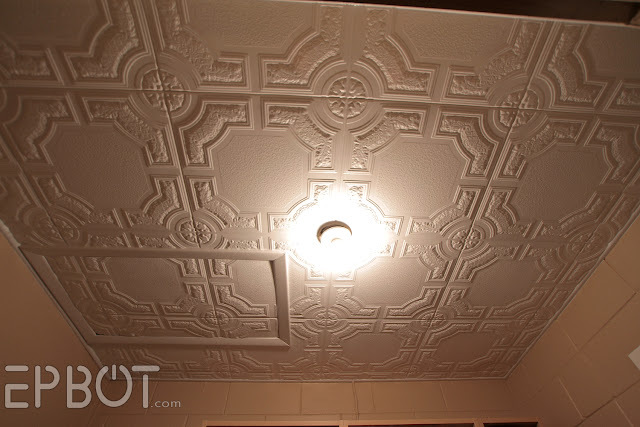 Ok, resources: there are several sites selling these tiles (just google "Styrofoam ceiling tiles") although most seem to have all the same styles. Almost all of the sites have every design at a set $3.99 per tile, but I price-shopped around and found mine for only $2.18 per tile over at StyroDecor. (SOLD!) Shipping was $14, so the whole ceiling only cost me about $65. 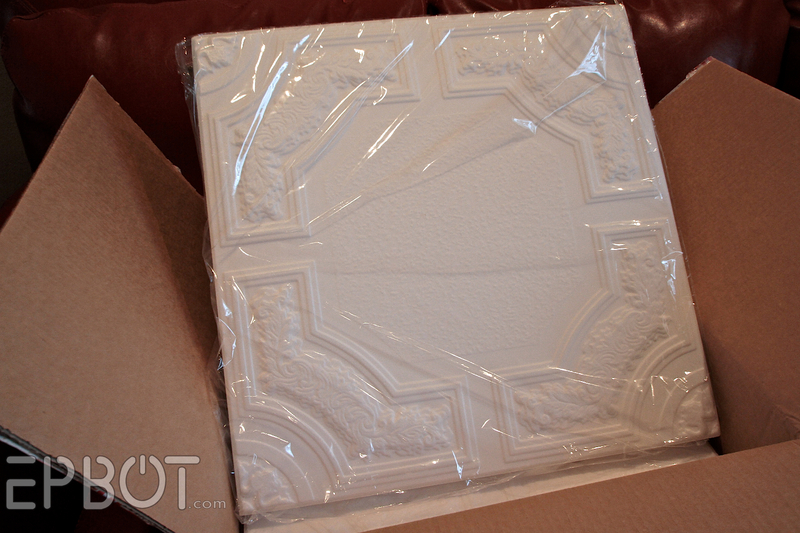 And the tiles were here a day and a half later - that's the fastest shipping of anything I've ever purchased online! And since I'm gushing, let me assure you I'm not being reimbursed in any way for anything in this post. (If only...) I've also purchased from Ceiling Tiles By Us in the past, and that was an equally awesome experience. I think they even e-mailed a week later to ask if I needed any help, and to see how the install went. K, that's all for now! Hope you guys enjoyed seeing what we've been up to the past week! What an improvement! 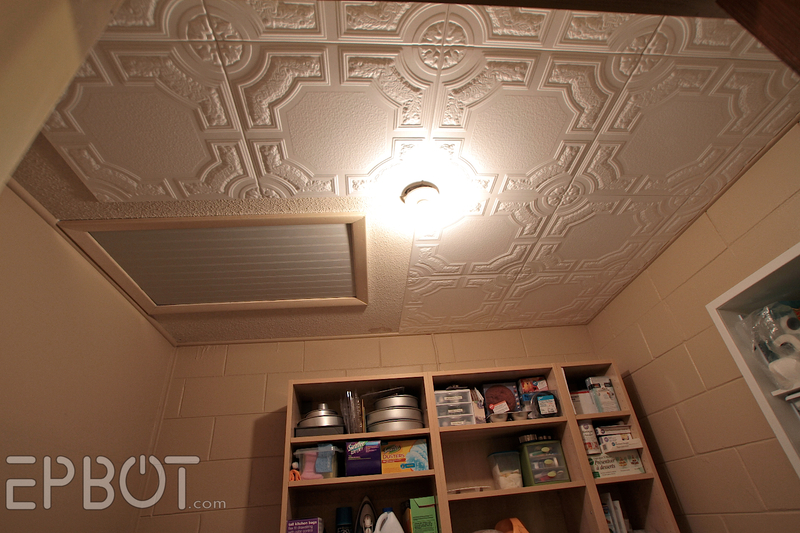 I've never seen those Styrofoam ceiling tiles before - they look nice! Also, I am for some reason extremely amused by the fact that you've watermarked that Before picture of the manky floor and streaky wall. What program is that pray, tell for a wanna be blogger. I wish someone would create a "so you wanna blog, but don't have the time nor care to actually visit a website explaining how... "
i would like to know, what is the name of the pattern in ur office and where did u buy those tiles..i looked at the 2 places you said you bot from but without the name of the pattern i must be overlooking it?? ur reno's look terrific! thank you.. Yes I would like to know where u found the office ceiling as well I love it! 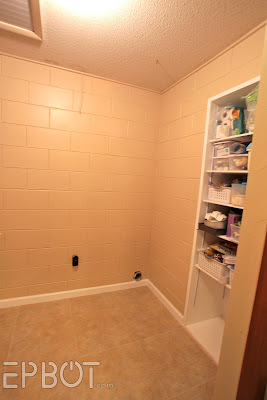 Wow, you guys are going to have one beautious laundry room! ;D And let's not even talk about the pink closet with the chandelier...what? Everybody's closet dosen't look like that??!??! We've used tin tiles for a few projects around our house lately. LOVE them. We're doing renovations that include pulling off some wall treatments from the '70s and '80s (and also trying to restore a '20s/'30s aesthetic which was renovated out in the '70s), and tin tiles are such an easy, inexpensive way to cover gross walls. We used a classic silver behind the stove, a deep brown above a fireplace, and a grey/lilac/purple-y color as a kind of wainscoting in the bathroom. So much easier than re-drywalling each of those spaces, and it's such a charming look. i love you so much right now! we have a fugly bathroom (not vintage!!) and want to do an affordable cosmetic upgrade on it - now I know what to do with the ceiling!! brilliant and beautiful!! This post makes me wish I wasn't living in an apartment. Popcorn ceilings must GOOOOOOOOO. 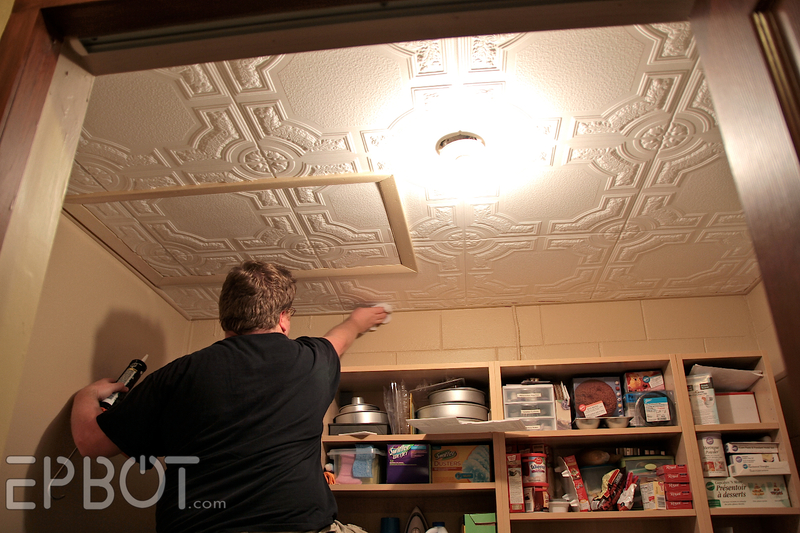 O. M. G. We have a gross popcorn ceiling in or living room that is now SCREAMING for me to do this! I've been putting off painting in there because I couldn't figure out what to do about the ceiling! Seeing your home improvements really makes me wish I owned our home instead of renting it. Those tiles are FAB!!! Flippin genius. Gotta get me some of those. Thanks for the info! I've been looking to do this to our entryway, which currently has hideously ugly snap-together acoustic foam tile attached directly to the plaster ceiling. Since I also have a 1920's house that was massacred in the 1970's, by really inept do-it-yourselfers, there's some trepidation in checking what condition that ceiling is in under (above?) the tiles. I've looked at the metal tiles before as well, but this helps to see that the stryofoam ones may also be a viable option for us. Oh - what type of caulk do you use? Clear or white? We used white; easier to see where you've already caulked that way. Plus the clear silicone caulking can make acrylic paint bead up, so watch out for that! OH. WOW. We are about to redo our finished basement ceiling (all dark hard wood... can you say man-cave?) and you just saved me some serious $$$! I've been shopping tin tiles but Imma tryin' this! Thank you Thank you Thank you! I had seen those tiles but had no idea that they could go OVER popcorn. That is too cool! My dad and I put up wallpaper on the ceiling of my parents kitchen to similar effect. It was over 10 years ago and has held up well. Also painted white. Thank you for posting this! My husband and I were just looking at tin tiles to do our kitchen ceiling last night, and were lamenting at how expensive it would be! The styrofoam will be 1/3 of the price and look just as awesome. I love this idea for jazzing up a laundry room! I might just have to show my husband so we can do this, too! I think I'm in love with your closet, without even seeing the rest of it! So awesome. :) And the ceiling tiles are great, I never would have thought of something like that, but it seems like an easy way to really make a space more fun. Anyway, I adore the re-do! You guys are create-tacular, with a side order of awesome sauce. It's not hinged, so we'll definitely have to be careful when opening the panel.The foam is sturdy enough to push up on without causing damage, but sharp things can dent it for sure. We only rarely need access to the attic, though (it's more of a crawl space, really), so I think we'll be Ok.
First time comment-er?, long time...reader? Anyways, do be careful with the bulb around the styrofoam there. It can start a fire if it comes into contact with the styrofoam tiles. I only mention this because I saw a garage burn down because of this exact thing. So unless they have a fire-retardant coating on them I keep a 2 inch clearance at least from the porcelain to the tile. But other then that it looks really nice, believe it or not I have gotten some really cool ideas that if my wife lets me we might try. Ahh, good to know! We'll be swapping out that old light base anyway, but I've also cut out the foam around the base, so it only overlaps a tiny bit on the edge. Makes sense that you'd want to keep the bulb as far away as possible from the foam, though. Well, holy crap THIS is fortuitous timing! I have been struggling with what to do with my kitchen ceiling and I think this is the answer. I am so excited to start researching and getting this next project started! Thanks for posting your marvelous work. That's really impressive. Where did you get the swirly one in your office? I didn't see that one at either of the websites and I really like that it's such a big pattern! The pattern in my office is really hard to spot by the tile alone, so it's no wonder you didn't recognize it. (The single tiles are a kind of four-pointed inflated diamond shape, but when you put them together you get the giant circles.) The design number is R-13, and here's the link over on Ceiling Tiles By Us. I love the swirly design too. Mostly because I can't even see the lines. How were you able to accomplish this? When I look at the site, I can see their lines. We used lots and LOTS of caulking, although I'll also say that some sites look like they have a slight outside edge to the design, where ours did not. Be sure to look closely at the examples, or maybe even e-mail to ask the seller ahead of time. I've seen slight variations in a couple of the more popular tile designs, so you want to make sure it's exactly as pictured. Could you, in fact, paint the pieces BEFORE putting them up on the ceiling?? AMAZING, will be doing this! Yes, you can! We only wait to paint after installing because of all the caulk lines. http://fasadeideas.com/applications/backsplash I've not seen the styrofoam panels before, but we've used the plastic ones in our kitchen for the backsplash. I've never heard of these before. They definitely look awesome. You made the ceiling access disappear! You are magic! This is awesome! I think I know what I'll be doing to get rid of the awful popcorn ceiling...someday, when we get to fixing this darn place up. Btw...any solutions for stupid textured walls? The old owners here textured almost every wall in the place. It's awful and ugly. who invented that idea in the first place?! I recently opened my own wedding and event floral studio and we used Ceilume Tiles to cover the ugly drop ceiling. It was acoustical tile stained all over and just bad. They tiles are injection molded, light-weight and just slide into the track in the ceiling. Very similar product. You can also glue to ceiling as well. I highly recommend. Plus, they're paintable. Those tiles are awesome! They would look awesome (in the proper room) painted with some copper metallic paint to resemble real ceiling tin tiles. Thanks for the idea! 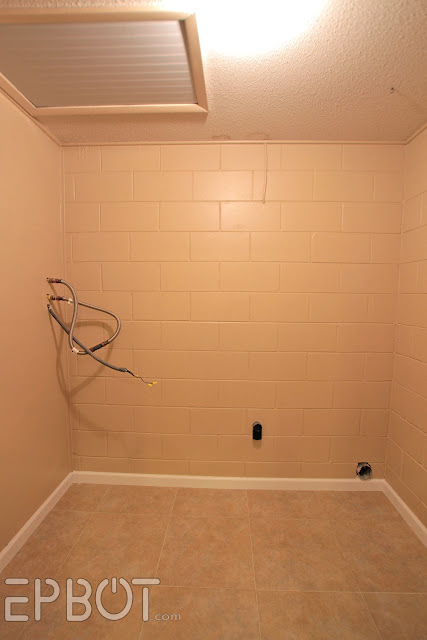 Remember, check how old your popcorn ceiling is before as much as touching it! Asbestos-based ones are still hanging around! Those would be perfect for the ceiling of my dressing room (which is kind of a half bedroom). Mind. Blown. You are the DIY King and Queen and I humbly lay my thanks at your feet for telling us about this. I've been trying to figure out how to work a popcorn ceiling into the Art Nouveau look I want for my upstairs... this is my answer! You are a goddess! We have been searching for a ceiling tile to finish out our "Zen Room" and one of the two suppliers you linked to had the perfect thing! I have been searching for YEARS! Thank you! That looks incredible! I love it! I love to see the home improvements and DIY that you do. You are always awesome at giving really well detailed instructions that make me feel like I could probably actually follow along! Thanks! Wow! I love all the work that you guys have done! Looks really amazing! My favorite design is still your office though I love them all. Do you guys know if they can be painted? 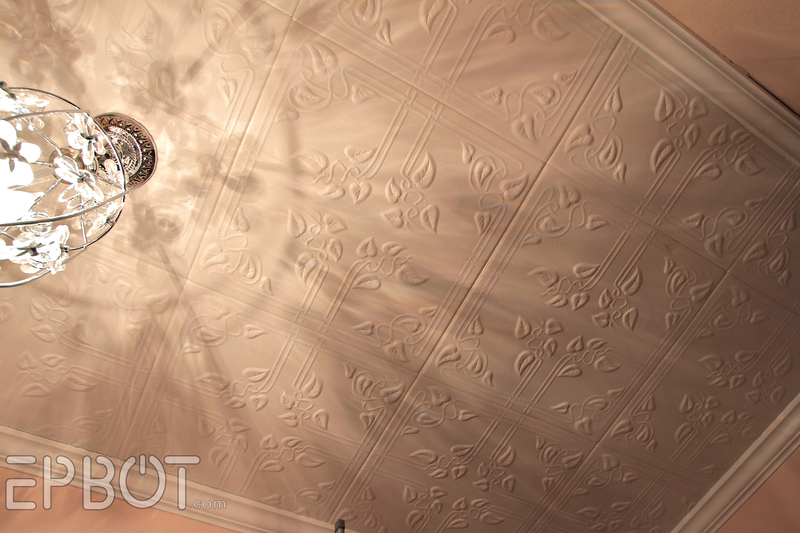 I love the white but I also love painted ceilings. Such a rad idea. You're like your own little DIY show in the making. We have the same exact floor tile in our kitchen O_0. I'm very sad. 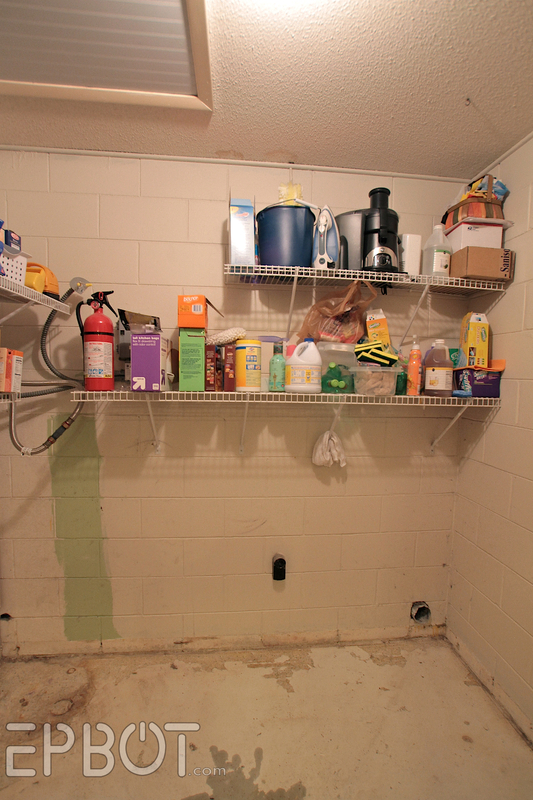 Your "before" shots look like my current kitchen. 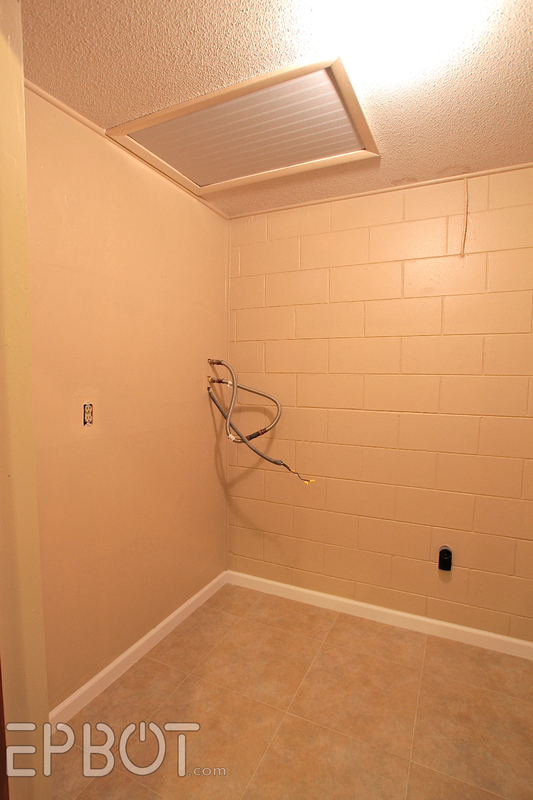 Stick-on-floor, oddly painted walls, hole in the ceiling, we've got it all. Right down to the strange wires and pipes hanging out of the wall...because my stupid washer and dryer are in my stupid kitchen, right between my wonderful dishwasher and my beautiful stove. No cupboard or cabinet surrounds them, they are there, front and center, 24/7, 365 days a year. Ever try to wash underwear in the same place you're cooking Thanksgiving dinner? At the same time? Yeah. Like that. Disgusting. On a happier note, I'm gonna do these tiles on every ceiling in my house! They look great. I think silver painted ones would look beautiful in my kitchen. Thanks for a great idea. I am totally LOVING your closet light fixture! WANT. I just forwarded this blog post to my husband and his immediate response was : "When are we getting these?!" beautiful! Will have to keep it in mind for future work. My 5yo son was reading over my shoulder and said "Mommy, are they putting up a Portal ceiling? It looks just like the cubes!" A juicer and a fire extinguisher... Lolz. Hi Jen, I am in the UK and we had styrofoam tiles ages ago but there were a few fire problems and so they were removed from sale. Personally, I love them as a ceiling solution - usually the US are way ahead of us with health and safety products, have these been changed or do you know anything about their fire retardent properties? Where did the tiles from your office ceiling come from? I can't seem to find that pattern and I think it would work the best on a large living room ceiling. I always mentally file these posts away for when I own a home. Recently, my boyfriend wanted to make a mobile for a friend's forthcoming baby, and I said "oh! Jen posted a mobile tutorial!" and he said "oh, Epbot? Pull it up!". Turns out they bought one already, but for the next kid born to friends, he's got a great idea. Oh, if only I owned my own house - I would definitely do something like this. Sadly, the most customizing I can do is hanging photos and posters and curtains - it does help make things feel like home, but I wish I could do more! I had to come back to this posting just to giggle some more at Jon wearing his Don't Give a Care bear shirt 'cause I finally saw it again on woot. Yeah, I'm a bit of a t-shirt nerd. This is SUCH a great idea. My friend lives in an older place with a real painted tin ceiling, but the paint flakes off and repainting everything means you have to strip the whole ceiling and do it over again. This seems like a more updated version, and it looks great in your utility room! You'll have to let us know how it holds up. I officially love this! I love all of the ceilings you've done. I have closet envy, and desperately want to see the rest of it!!!! Beautiful work on all the ceilings. did you caulk the outer edges or is that trim? The tiles are butted up against the trim (which was already there), and then caulked. I loved your pictures - thanks for sharing. I must ask: in your office and closet... how did you do the crown moulding? We have a large stock pile of crown and are in the process of redoing (darn near) every room in our early 1900's house. We are having quite the time (even though my husband is a fantastic carpenter) doing the corners as nothing is square. Any tips/tricks you can give us? Hi! john here. So I have two tips for you when cutting crown. First is to use an angle finder which helps immensely. That way, if you find the wall is actually 88 degrees as opposed to 90, you can cut each side of your crown to 44 and be done with it. The second tip is actually something that a lot of carpenters do that is kindasorta wrong. See, you're supposed to use a compound miter saw, finding both angles to cut the board while it's lying flat. The problem is that is really hard. So instead, wedge the trim onto the saw at the same angle it would be on the wall (usually 45 degrees) and only worry about the miter cut or angle that the two pieces of crown will meet. This is the quick and dirty way of doing it but a lot of carpenters will do this for crown since it's going to be caulked and painted anyway. Thank you so much for the tips. If there was a way to attach a photo - I'd send you one of our front room where there is only one corner of crown. I just keep ONLY looking at that corner and say... man... that sure does look mighty nice. While I strategically place every photo to only have that corner in the background. Hi, I have fallen in love with the tiles in your office, do you remember their name? The two sites you linked to seem to be out of that design. Thank you so much, it really is the most amazing pattern. If you must use them (and personally I wouldn't have polystyrene ceiling tiles in my house) then they should be glued all over, not dot-and-dab, to reduce their propensity to drop lumps of flaming plastic in a fire. Thank You, Thank You, Thank You for doing this tutorial. 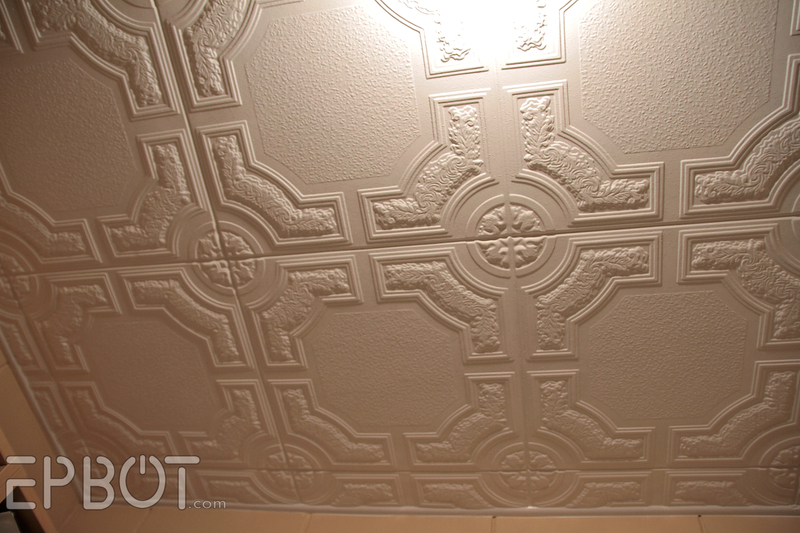 We have an awful texture on our ceilings. Its not popcorn, its like they loaded their trowel with sheetrock mud and pressed it on the ceiling and then pulled it off and left the effect. I HATE it. I've wanted to cover it up for years but most options were too expensive. This isn't. I just ordered some for my first room. Since I'm redoing my kiddo's room, his will get the first cool ceiling. 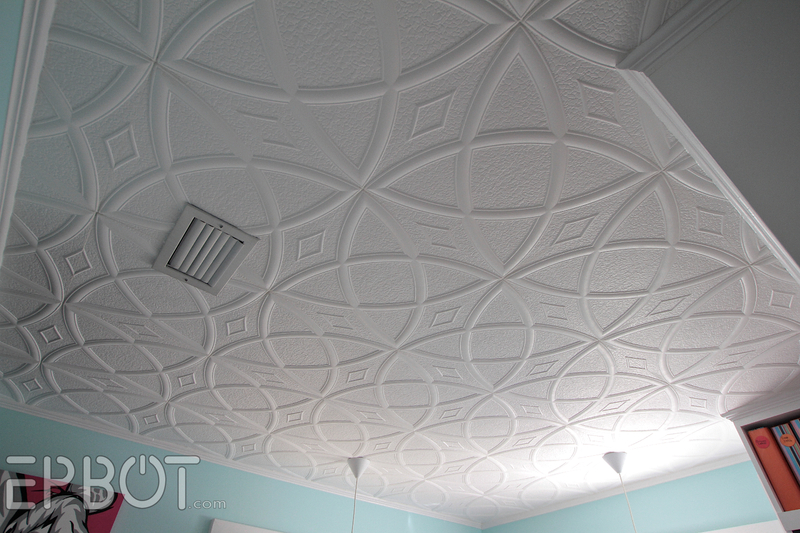 I love how your office ceiling turned out. Hope that helps! And good luck with it! I just found your article through Pintrest I love you swirly office tile but have checked both companies you listed and cannot find it Did I miss it or is that from another company? When I bought mine there was no name, just an order number, but I see this site calls it "Elliptical Illusion." Here's the link. Where did you get the ones for your office!! I LOVE THEM! YES..... I'd like to know too. Is this the Circles and Stars design you have up there?? No, that one's similar, but not quite it. Follow the link I posted two comments up; that's the one! YES, please do tell. They are beautiful!! Where exactly did you purchase these tiles? 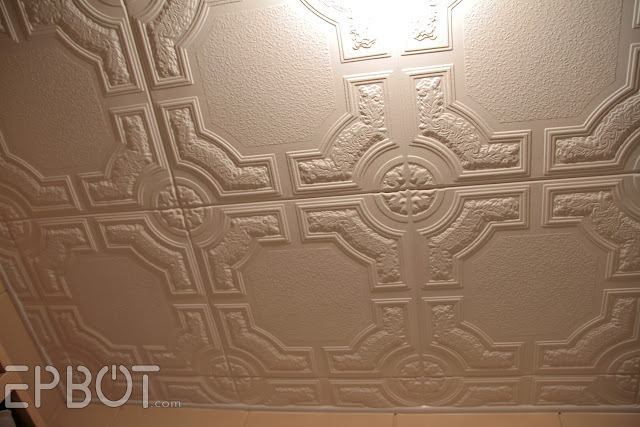 I have popcorn ceiling and would love to use these to update my house! Thanks! have a cathedral popcorn ceiling. might want to give it a go in my bedroom or spare bathroom. thanks for the tutorial and advice. I Love the tiles you used in your office. Can you tell me where you purchased them and what the pattern name is. I looked at both websites, but didn't find one that look close you what you installed. I would love to install this in my bedroom.